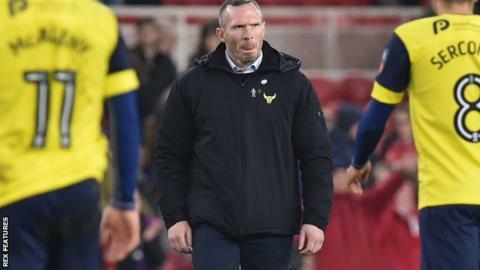 Oxford United boss Michael Appleton has urged his players to "quickly move on" from their FA Cup fifth round exit. The U's lost 3-2 to Middlesbrough on Saturday after coming back from 2-0 down against the Premier League side. Appleton's side return to League Two action at Charlton on Tuesday and are also in the EFL Trophy semi-finals. "It's been great," Appleton told BBC Radio Oxford of the cup run. "But right now, it's all about wiping the memory of this out of the players' systems." Oxford are 12th, seven points off the League One play-off spots, but with two games in hand on sixth-placed Southend United. "It's going to be a long shot (to reach the play-offs) as we're probably going to need about 10 wins out of the 16 games left," Appleton said. "The players will be down right now, but it's our job to make sure we pick them up as fast we can and dust them down." Goals from Chris Maguire and Toni Martinez within two second-half minutes brought Oxford back into the tie at Middlesbrough before Cristhian Stuani scored Boro's winner four minutes from time. "It wasn't to be," Appleton added. "But, the players gave me that belief and encouragement for each other that we're going to need while still fighting on two fronts."